Facebook results in strong community and user interaction. Now this can carry on, even when actual person behind a specific Facebook has died. Facebook has rolled out a new contact form by which any Facebook user can inform it about death of other Facebook user, which could be a family member or friend. Click here to access the Deceased Facebook form. 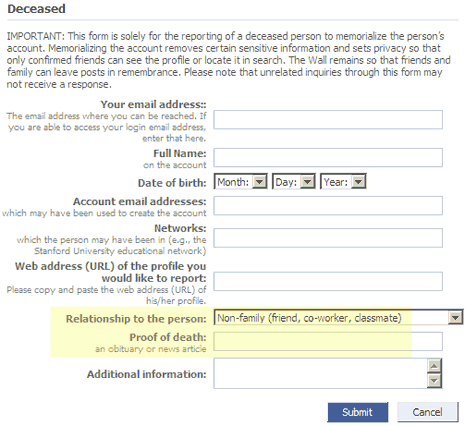 You need to enter Facebook profile URL of dead person along with Proof of death like an obituary or news article. As pointed by Facebook Blog, it will make some changed to profile of deceased person like delete certain private information, set privacy so that only friends can see profile. Account Walls will be preserved and other users can post message in memory of departed friend. This looks interesting but some users may use this to report FAKE death of other Facebook users. Hope Facebook is preparing get a life form and bring back dead people with Facebook profile, if any!